HealthFitness takes credit for program savings without having a program « They Said What? Success at risk reduction and translation of that risk reduction into cost savings. These excerpts are from the successful Koop Award application at http://www.thehealthproject.com/documents/2011/EastmanEval.pdf. Reduction in risk factors from 3.20 to 3.03 — net change of 0.17 — over 5 years. This success excludes dropouts. Since only about 20% of all inpatient events are wellness-sensitive, and you only reduced risk factors by 0.17 per person, and hospital expenses are at most 50% of total spending, how is it that you are able to reduce spending by 24%? 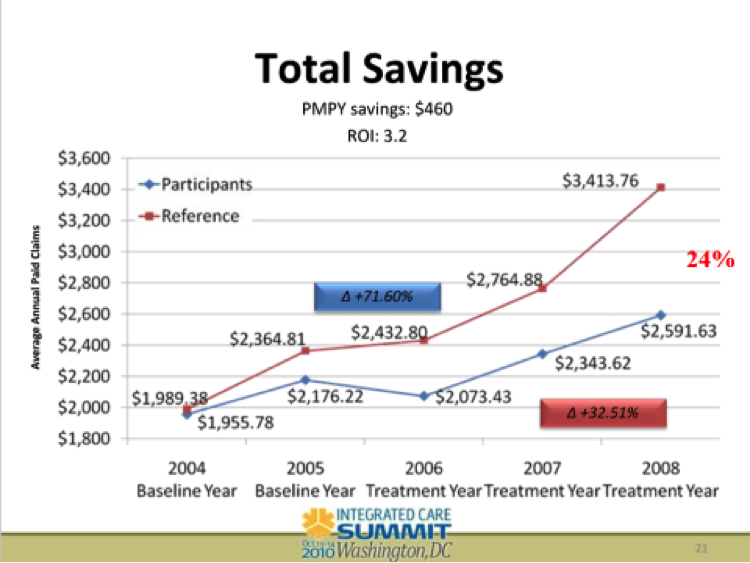 Why did you take credit for savings in 2005, even though according to your own slide you didn’t have a program in 2005? Does starting the Y-axis at $1800 instead of $0 create the illusion of greater separation between the two cohorts? Your website says that comparing participants to non-participants “adheres to statistical rigor and current scientific standards for program evaluation” and “is recognized by the industry as the best method for measurement in a real-world corporate wellness program.” Can you explain how non-motivated non-volunteers who decline financial incentives to improve their health are comparable to motivated volunteers, especially in light of the separation between the two groups that took place just on the basis of differential mindset in 2005, before you had a program? You and your customers have won three Koop Awards in the last 4 years. Do you think also being a sponsor of the Koop Award (along with Eastman, in this case) has helped you win these awards or is this just a coincidence? Why Nobody Believes the Numbers defines the “Wishful Thinking Multiplier” as “alleged cost saviings divided by alleged risk reduction.” Your cost savings is $460 and your risk reduction in 0.17, for a Wishful Thinking Multiplier of 2700, the highest in the industry. The book calculates that a risk reduction of your magnitude (even assuming dropouts also reduced risk by the same amount) could generate roughly a $8 reduction in annual spending. To what do you attribute your ability to reduce spending by 50x what is mathematically possible? Help us with the arithmetic below, also from this Koop Award application. How is it mathematically possible to have a higher ROI ($3.62) when also including the cost of incentives in program expense than the ROI ($3.20) excluding the cost of paying incentives to employees to participate? Update December 2014: Ron Goetzel admits HFC lied. (See #5 and #6.) The slide was “unfortunately mislabeled,” using the passive voice, as though it was an act of God (“the game was rained out” ) or else perhaps the North Koreans. The geniuses at HFC apparently didn’t notice this “unfortunate mislabeling” for 4 years, despite it’s having been pointed out to them many times before this. Is your opinion that these are honest mistakes? We put these observations in the form of questions so that readers can draw their own conclusions. When drawing yours, here are a few facts to consider. HFC pulled the slide being highlighted off their website after we “outed” it, but didn’t change the savings calculation that the faulty analysis produced. HFC didn’t answer the questions we posed even though we had offered them $1000 to do so. If you read the other posting about the Koop Committee and HFC, you’ll see in that one HFC admitted lying. They sponsored the Koop Award but none of their announcements when they’ve won these awards (which — not surprisingly given their sponsorship of them — they have done many times) mentioned the sponsorship. To claim that completing a “cultural assessment” represents a meaningful intervention, or that filling out a HRA reduces health risks are not mistakes. Both represent a genuine lack of understanding about what it takes to change the health behaviors of a population. One would expect that an organization in the business of doing just that should know better, as well as understand basic mathematics.